This is one of the absolute best dishes I made this winter. It's the perfect comfort food on a chilly night. The only really time-consuming part of the dish is rolling the meatballs - if you're in a rush, you could easily just combine all the meatball ingredients in a skillet (minus the panko and egg) and brown the meat, and then add to the sauce for a delicious meat sauce. Then again, meatballs are a lot of fun and well worth the effort...just recruit a helper or two! The meatballs are cooked in a spiced tomato sauce that's super flavorful. You can serve the meatballs with anything you like - the original recipe suggested pitas, but couscous or pasta would be excellent as well. Since I had some extra goat cheese in the fridge, I decided to go with the Pioneer Woman's fantastic goat cheese polenta. It's creamy with wonderful corn and goat cheese flavors, and it goes perfectly with rich meatballs (although it definitely takes the dish out of "Cooking Light" territory). My secret to making good polenta is to use a non-stick pot to make it - you don't have to worry about sticking, and you can get away with a little less whisking. Start the polenta a few minutes after you put the meatballs on to simmer and everything should be done about the same time. 1. Heat enough oil to coat the bottom of the pan in a large non-stick skillet over medium heat. Add 2 T of the onions and the garlic, and cook until translucent, stirring often. Let cool slightly, and then scrape into a large bowl. Add the panko, mint, lamb, ground beef, and egg. Season with 1/2 tsp of the salt and several grinds of black pepper. Mix to combine with your hands, and then shape into small meatballs. 2. Return the pan to the stove, add more oil as needed, and heat over medium-high heat. Add the meatballs, and cook, turning often, until they are browned on a couple of sides - no need to cook them through completely. Transfer the meatballs to a bowl or plate. 3. Adding more oil if needed, add the remaining onions to the skillet and saute until translucent and starting to brown. Add the ginger, cumin, cinnamon, and tomatoes, and simmer 5 minutes. Season with the remaining 1/2 tsp salt and several grinds of pepper. Stir in enough water to make a loose sauce, and then stir in the meatballs. Simmer 20 minutes, adding more water as needed. 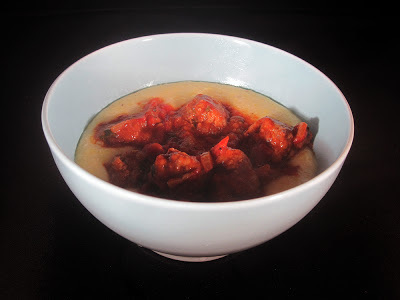 Serve over goat cheese polenta. 1. Bring 3 cups of water to a boil. Add the polenta in a thin stream, whisking constantly to prevent lumps. Season with the salt. 2. Reduce heat to a simmer, and cook 15 minutes, whisking often. Add more water as needed to get your desired consistency. 3. When the polenta is done, whisk in the goat cheese and butter. Taste and adjust seasoning. These buns look fancy, but they're actually really simple to make. I made them for Christmas breakfast, and they are actually a yeasted breakfast treat that's possible to make in the morning before brunch without getting up in the wee hours of the morning - about an hour from start to finish, including rising time. The dough comes together easily, even without a stand mixer - it's soft but not too sticky. It also rolls out perfectly even without any flour - I recommend rolling it out on a big piece of waxed paper or parchment for easily rolling up the buns. The recipe calls for Nutella as filling - so delicious, and who doesn't want chocolate for breakfast! 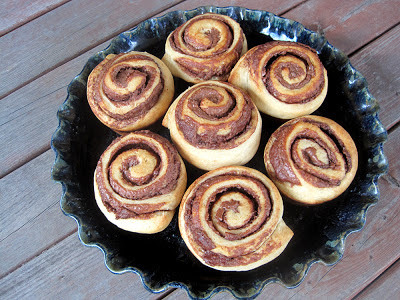 - but you could easily do a cinnamon roll filling if that's what you're in the mood for. Finally, the rolls are sliced and popped into muffin tins for perfect single-serving rolls. These were really delicious and looked so festive on the table - I will definitely be making this recipe again! 1. In a large bowl, whisk together 2 cups of the flour, the yeast, and cinnamon. In a medium bowl, whisk together the salt, butter, milk, brown sugar, and vanilla. Add the wet ingredients to the dry and stir together with a wooden spoon or rubber spatula. Add more flour 1/4 cup at a time until a smooth, slightly sticky dough forms. Knead for a few minutes. Cover with plastic wrap or a kitchen towel and let rise 20 minutes in a warm place. 2. Place the dough on a clean, lightly floured surface. Press into a very large rectangle, about 1/4 inch thick. You may need to use a rolling pin at the end to finish flattening the dough. 3. Place the Nutella in a microwave-safe bowl and heat until soft enough to spread easily but not completely melted. Grease a 12-cup muffin tin. 4. Spread the Nutella evenly all over the dough. Working from the long side of the dough, roll up the rectangle. Cut into 12 equal pieces. Place each piece of dough, swirl-side-up, in the muffin pan. Cover and let rise 20 minutes in a warm place. 5. Meanwhile, preheat the oven to 425 degrees. 6. When the oven is preheated and the dough is risen, bake the dough 12-14 minutes, rotating the pan halfway through the baking. The tops should be golden brown and the bottoms should be well browned but not burnt. Let cool in the pan for a few minutes, and then remove to a serving plate and enjoy warm. I hope everyone had a good holiday! 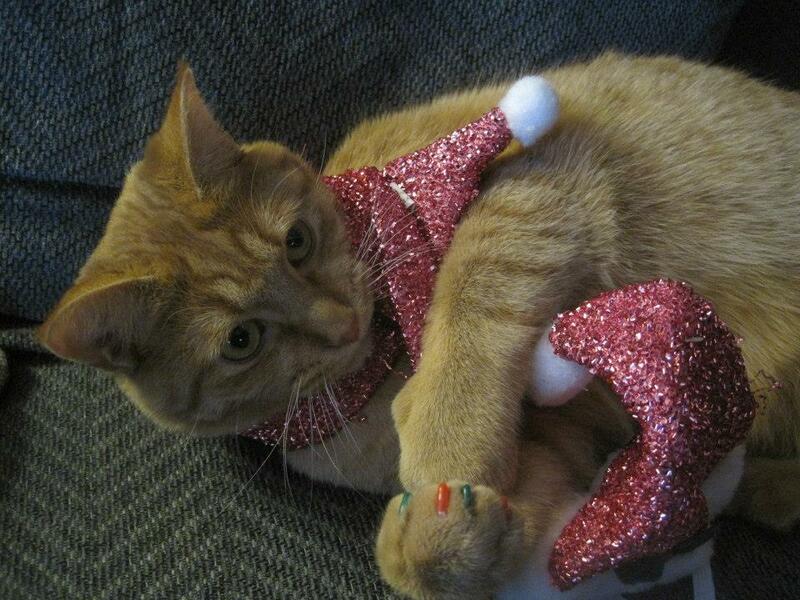 I had so much fun celebrating Christmas with my parents, sister, and grandma. There was snow on the ground, so it was a white Christmas, but today we're really getting a crazy amount of snow from Winter Storm Euclid (since when did they start naming these things?!) 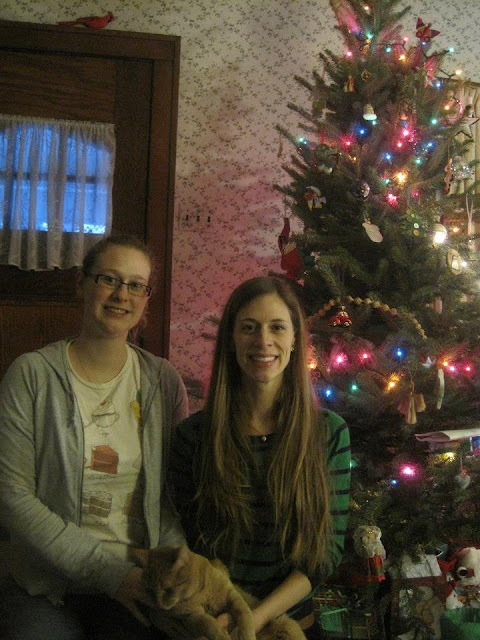 We also had a really delicious Christmas, with lots of different treats, including lots of kinds of Christmas cookies. These cookies are a little fussy but well worth the effort. As soon as I saw the recipe, I knew I wanted to try making them for Christmas. Chocolate croissants are one of my favorite breakfast indulgences, so I knew they'd be good as a dessert. Plus, they're so cute! 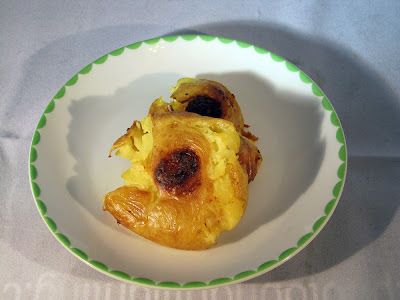 The cream cheese dough is really tender and flavorful, but not too sweet, a perfect combination with the chocolate filling. The dough is fairly soft, so definitely follow the directions and stick the dough in the fridge when suggested...your patience will be rewarded with delicious and adorable cookies. My only complaint with the recipe is that it only made two dozen...next time maybe I will make a double recipe! 1. Cream together the butter, cream cheese, and sugar on high speed for 3 minutes. Beat in the vanilla and salt. Mix in the flour on low speed. 2. Divide the dough into three equal pieces, press into disks, and wrap in plastic. Chill 15 minutes. 3. Preheat the oven to 350 degrees and line 2 cookie sheets with parchment. Starting with the first dough disk, place the dough on a piece of wax paper or parchment and place another piece on top. Roll out into an 8-inch round. Repeat with the other pieces of dough, and then stack them between sheets of wax paper or parchment. Chill 15 minutes. 4. Remove one dough round from the refrigerator. Spread with 1 T plus 1 tsp of the melted butter, sprinkle with 3 T mini chocolate chips, and then sprinkle with 1 T sugar. Press gently on the chocolate. Cut the circle into 8 equal wedges. 5. Starting from the wide end, roll up each wedge. Transfer to the cookie sheet. Repeat with the remaining dough. 6. Brush the cookies with egg white. 7. Bake 22-24 minutes, until golden. Transfer to racks to cool. So, I have to be honest that I didn't love these cookies. Then why am I posting them? Well, they were a big hit with everyone else. I'm just not a fan of this type of crumbly, crispy, powdered sugar-covered cookie. 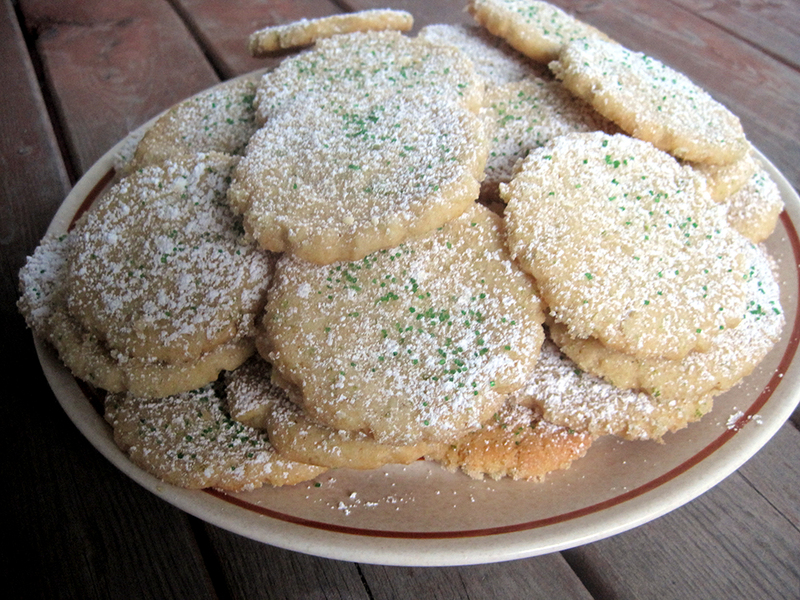 That said, I think these are a great version of that sort of cookie if you like them (and I think most people do!). Think a pumped up version of an Italian wedding cookie - same sort of texture and flavor, but bigger and with more lime action going on! This is probably my Dad's favorite style of cookie, so he was happy that I made them for once. :) Although these have quite a lot of ginger in them (both fresh and dried), I thought the lime flavor definitely took center stage - if you want more ginger here, you could increase the dried ginger or try adding some minced candied ginger (another thing I don't like! Boy, I never realized I was so picky when it came to dessert...) In any case, these would be a great addition to any Christmas cookie plate. Hope you have a wonderful holiday...I'll be back after Christmas! 1. Preheat the oven to 350 degrees and grease two baking sheets. 2. Place the sugar, zest, and ginger in a food processor and process about 2 minutes, until the mixture is moist and uniform. 3. Reserve 1/2 cup of the sugar mixture in a small bowl. 4. Place the remaining sugar in a large bowl, along with the butter, yolk, lime juice, corn syrup, ginger, vanilla, baking soda, and salt. Beat with an electric mixer on medium speed until light and fluffy, a couple of minutes. Add half the flour and beat into the butter mixture. Add the remaining flour and stir until completely combined. 5. Scoop out scant tablespoons of dough. Roll in balls, roll in the reserved lime-sugar mixture, and then place on baking sheets, leaving a good amount of space between cookies. 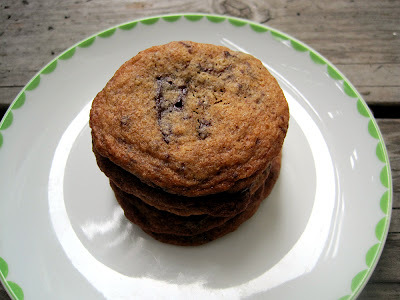 Press each cookie to about 1/4-inch thick with the bottom of a glass. Bake 6-10 minutes, until the cookies are set but not yet browned. Let cool on the baking sheet for a minute or so, and then transfer to a wire rack . Sprinkle with powdered sugar and green sanding sugar, and let cool completely. We've been getting a ton of baby bok choy in our produce box lately, so I wanted to try something a bit different with it. This recipe from Dorie Greenspan pairs this vegetable with French flavors - an unusual combination, but one that is really delicious! I love the idea of making the greens "en papillote" - sounds fancy, but it's super simple. You just wrap everything up in foil packets and bake until tender. This wouldn't work for many sorts of greens, but it's actually perfect with baby bok choy since the stems need some time to soften up. Paired with snap peas (good, but definitely optional - you could easily skip or sub in another green vegetable), this makes for a great green side dish. I served these greens alongside roasted chicken. I mixed up some softened butter with salt, Aleppo chili flakes, smoked paprika, orange zest, and fresh thyme, and then rubbed that under the skin of the chicken and baked it according to this recipe. 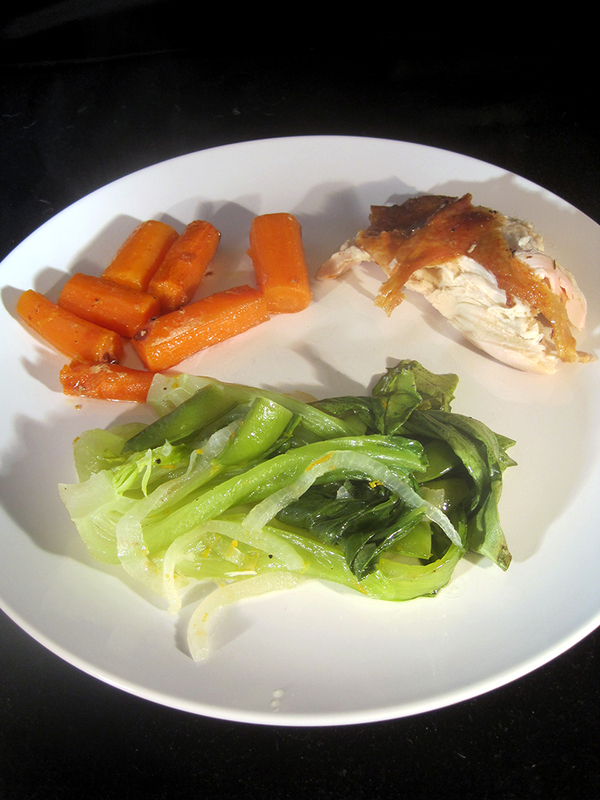 I roasted the chicken over carrots, which ended up super tender from being braised in the butter and chicken fat - yum. Those are probably the most unhealthy but also the most delicious carrots ever! 1. Preheat the oven to 400 degrees. Lay a large piece of aluminum foil over your largest rimmed baking sheet. 2. Cut each pea in half and toss into a large bowl. Quarter each baby bok choy lengthwise, and add to the peas. Add the sliced onions, garlic, and orange zest. Pour over a few glugs of olive oil and season with salt and pepper. Toss everything to combine. 3. Place the veggies on the foil and spread into an even layer, leaving about an inch of foil around the edges. Cover with another large piece of foil, and then crimp the edges together to form a packet. 4. Bake 15 minutes, or until the bok choy is tender. I love homemade pizza, but it does require some advanced planning to make the dough and let it rise. Enter this recipe for fast homemade pizza - I decided I wanted pizza for lunch around 11:30am, and we were eating by 12:30! At least in our area, you often can't get delivery in that amount of time, and this pizza is so much tastier than delivery. The game plan: make the dough - a stand mixer makes this part faster, but of course you can make it by hand as well. Let rise in a warm oven for half an hour. While the dough rises, prep all your toppings. Take the dough out of the oven and crank up the temperature. Press the dough into a pan, pile on the toppings, and then bake in a super hot oven until the cheese is all bubbly. Eat! As with all pizza recipes, the toppings are infinitely customize-able to fit what you like and what you've got in the fridge. This pie was definitely a clean-out-the-fridge pizza, using up a bit of heavy cream, various veggies we had from our CSA, and a couple of Trader Joe's cheeses. Panna, or unsweetened whipped cream, is a fantastic base for pizza toppings - it sounds crazy, but really it's just a super simple way to top your pizza with white sauce without making a bechamel! The piece de resistance is a bit of Sonomic balsamic syrup drizzled over the top. I highly recommend this if you can find it, but if you can't, you can always make your own balsamic syrup. So, with such a small time investment, how did the pizza taste? I have to admit, it was not as good as my favorite pizza crust recipe. However, that recipe takes two days to make, so you can't exactly have it on a moment's notice. Although it wasn't a 'best ever' recipe in terms of flavor and texture, this pizza crust was definitely very tasty and made a great base for flavorful toppings. This is a recipe I'll be going back to any time that pizza craving hits! 1. Turn oven to warm for five minutes, and then turn it off (you can do this while you mix the dough). 2. Pour the water into the bowl of a stand mixer. Sprinkle the yeast over and let sit 5 minutes. Add the flour and salt and mix with the dough hook until the mixture forms a smooth, elastic dough, about 5 minutes. Add more water or flour as needed. 3. Remove the dough, wipe out the bowl, and coat lightly with olive oil. 4. Form the dough into a ball, return to the bowl, and cover with plastic wrap. Place in the warmed oven. Let sit 30 minutes. 5. Remove the dough from the oven and turn the oven to 500 degrees or its highest setting. 6. Line a large baking sheet with foil and coat lightly with oil. Press the dough out over the baking sheet - depending on the size of your pan, it might not stretch all the way to the edges. If the dough won't stretch, let it rest for a few minutes to allow the dough to relax before continuing. Try to make the edges a bit thicker than the middle, since they'll cook fastest. 7. Sprinkle salt all over the pizza dough. Spread the cream (panna) evenly over the salt, leaving a bit of a border at the edges. Sprinkle the vegetables, cheese, and parsley over the panna, being careful not to load on too many toppings. Drizzle the balsamic syrup over everything. 8. Bake until the cheese is bubbling and the crust is browned on the bottom. Slice the pizza and enjoy while hot! 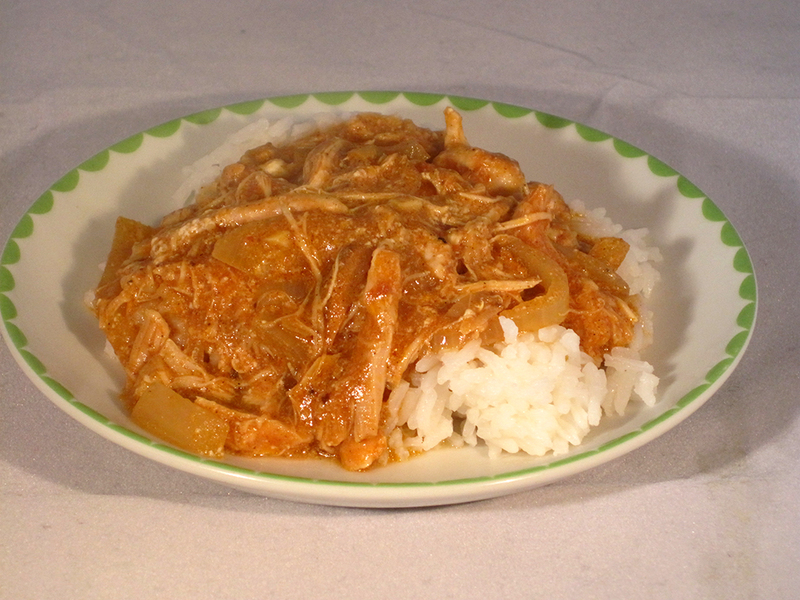 Wrapping up slow cooker week is this fantastic recipe for butter chicken. I made a more complicated (and probably more authentic) version of butter chicken about a year and a half ago. While that version was definitely really tasty, this one easily rivals it, especially since it is so much easier! This is basically a dump-everything-in-the-slow-cooker recipe - no browning, and not even a ton of chopping. The results are super flavorful. The chicken ends up very saucy, which is great because the sauce is so yummy - but, if you're looking to stretch this recipe, you could definitely add more chicken at the beginning. Leftovers reheat well, so I may do that next time. If you're a fan of spicy food, I'd also recommend adding some red pepper flakes or even some chilies, as this recipe is very mild. 1. Place the chicken in the bottom of the slow cooker in an even layer. Scatter the onion, garlic, and butter evenly over the chicken. 2. In a small bowl, whisk together the cardamom, curry powder, garam masala, Aleppo pepper, ginger, and salt. Evenly scatter over the chicken. 3. In a medium bowl, whisk together the coconut milk tomato paste, and lemon juice. Pour over the chicken. 4. Cook on high for 4 hours (or on low for 8 hours). Shred the chicken with two forks (should shred easily). 5. Turn the slow cooker to low and stir in the yogurt. Cook 15 minutes or so, and then serve with rice. Continuing my week of slow cooker recipes is this excellent vegan offering. I'm a big fan of caponata, but I never thought to make it in the slow cooker! It worked perfectly - everything got nicely tender and all the veggies stayed juicy in the crockpot. 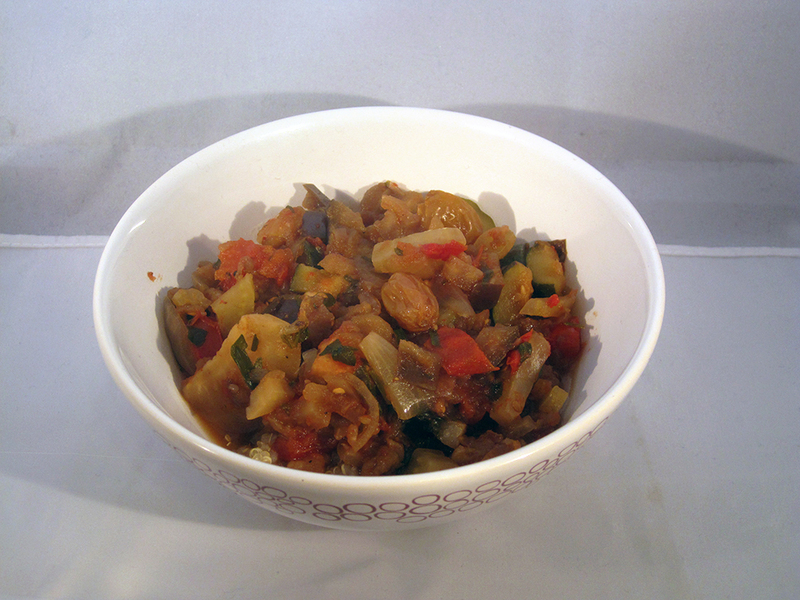 If you've never had caponata before, it's a mixture of tomatoes, eggplant, and zucchini with various other flavors added to make an extra delicious vegetable dish. I've often seen it served on crostini as an appetizer, but it works great as a main dish as well - we served it over quinoa, but pasta or couscous would be a great accompaniment as well. This dish does involve a lot of chopping since there are lots of veggies, but then it's just set it and forget it - so easy! Combine everything in the crockpot and stir to combine. Cook on low heat for 8 hours, stirring halfway through if you happen to be home (I think it would be fine not to do this if you aren't home!). Taste and adjust seasoning. Serve over quinoa, rice, or pasta. 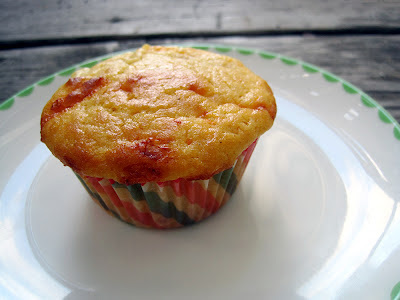 Get ready for slow cooker week on Cupcake Muffin! I realized I had a bunch of slow cooker recipes in my draft posts, so I thought it would be fun to share them all in one week. And, this is the perfect time of year to do it since everyone is busy and could use a bit of a break. There's a little bit of everything - pork today, plus a vegan crockpot recipe and a chicken recipe coming up later this week. 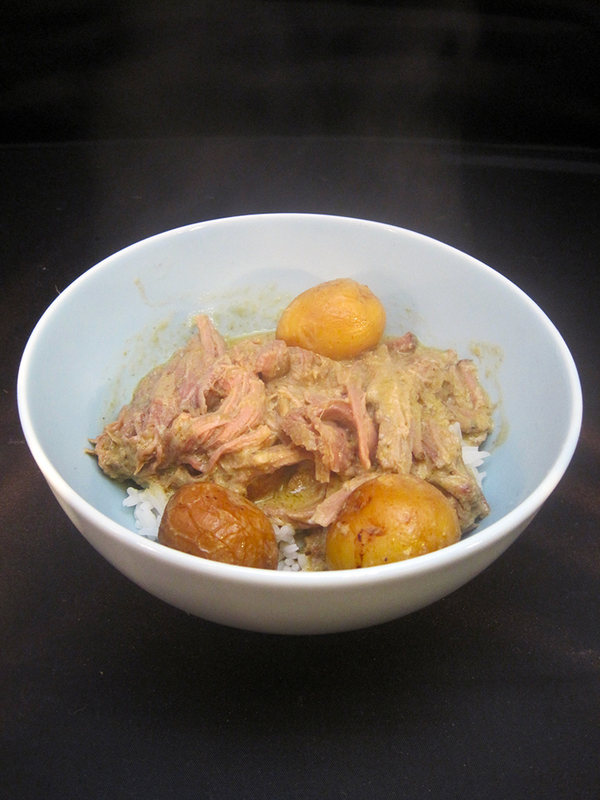 Up first: slow cooker green curry pork! I was actually a little worried about this recipe, because the reviews in the comments were somewhat mixed - some people thought it was fantastic, but others thought it was too bland. I'm guessing the difference may have been from using different brands of curry paste, since the other ingredients are pretty standard. I've listed the curry paste I prefer below, but you might need to play around with what's available in your area to find one that you like (and to find one with your preferred spiciness level). In any case, my curry turned out absolutely delicious! It's creamy, spicy, and so flavorful. The combination of super tender pork and creamy potatoes just can't be beat. 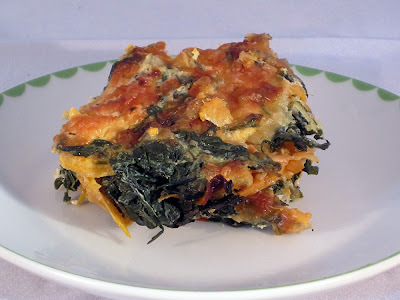 My only 'complaint' about this recipe is that it doesn't contain a vegetable, so despite using the slow cooker, you'll need to do a little bit of last-minute prep - I made simple sauteed spinach with lemon juice, which was a great accompaniment. 1. Season the pork with salt and pepper. Heat a nonstick skillet over medium-high heat, and add enough oil to just coat the bottom of the pan. When the oil is hot, add the pork and brown on all sides. 2. Scrub the potatoes, and cut any that seem larger than usual into pieces - the ones I used were the size of large cherry tomatoes, so I didn't bother to cut them. Place in the slow cooker and sprinkle with salt and pepper. 3. Place the pork on top of the potatoes. 4. Return the skillet to medium-high heat, and add more oil if necessary. When it is hot, add the curry paste and fry for 3-5 minutes, until very aromatic, stirring constantly. Whisk in the coconut milk and cook for another few minutes, until bubbling. 5. Pour the curry sauce over the pork. Cook for 8 hours on low, until the pork is fork-tender. Stir in the lime juice. Taste and adjust seasining. Serve with rice. When I saw this recipe in Cooking Light last month, I was really excited to try it. We got a kabocha squash in our CSA, so it seemed like the perfect time. If you can't find a kabocha squash, you can definitely just substitute in a different winter squash - the original recipe calls for butternut, and I bet acorn would be tasty as well. Definitely do yourself (and your hands) a favor and simply cut the squash in half and then roast - it takes a bit longer in the oven than peeled chunks would, but to me it's totally worth it to cut down on the prep time. Once the squash is roasted, it's scooped out of its skin and added to a healthy white sauce (milk, eggs, and onions). The squash is creamy enough to create a delicious sauce without the use of half-and-half or cream. The sauce is good, but pretty sweet, meaning that the garnishes are not optional. Nutty pecans and salty blue cheese are essential for balancing out the sweet squash, making for the perfect bowl of comforting pasta! If you just can't stand blue cheese, I bet goat cheese or lots of shaved Parmesan would be great as well. 2. Cut the squash in half and scoop the seeds out. Lightly coat the foil with oil, and then rub the cut sides of the squash with more oil. Place on the baking sheet, cut sides up. Sprinkle with salt and pepper. Roast until tender, about 30 minutes. 3. Let the squash cool until cool enough to handle. Scoop the flesh from the skin, and break into bite-sized chunks. 4. Bring a large pot of water to a boil and then salt it. When it boils, add the pasta and cook according to package directions. 5. While the water is coming to a boil, make the sauce. Heat a bit of oil in a non-stick pan over medium-low heat. Add the onion and garlic, and season with salt and pepper. Cook, stirring often, until the onions are very soft but not browned. 6. Pour 1/2 cup of the milk into a small bowl, and whisk in the flour and egg yolks. Set aside. 7. Pour the remaining 1/2 cup milk into the skillet with the onions and whisk to combine using a silicone spatula (so that you don't scrape the non-stick coating). When the milk starts to bubble, slowly whisk in the milk-egg-flour mixture, and cook, whisking constantly, until the mixture thickens slightly, 4-5 minutes. Fold in the squash using a rubber spatula. 8. Drain the pasta, and gently fold in the sauce. Gently heat over low heat, stirring, for about 1 minute. 9. 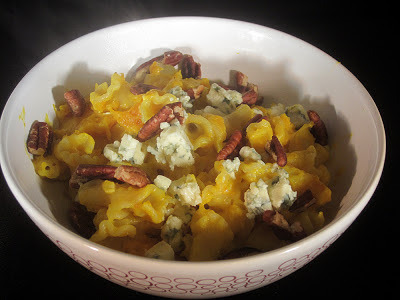 Transfer to serving bowls, and then sprinkle with blue cheese and pecans. I'm totally in love with this simple dessert. It comes from a Jamie Oliver cookbook that I picked up on sale a while back, and I've been mostly happy with the recipes I've tried from it. This one was definitely a winner, in that it was both easy and delicious. The original recipe actually calls for a prepared tart crust to save time, but I'm not sure I've ever seen anything like that at my grocery - maybe it is a British thing? I don't think you'd want to use regular pie crust, since the texture would be off. In any case, the recipe I have linked to below is a fairly straightforward one that you can make entirely in the food processor. Definitely use a good quality jam here since it will contribute most of the flavor. I pulled a jar of homemade cherry jam out of the freezer, but I can imagine lots of fruits being delicious here. Depending on what citrus you think would combine well with the jam, you can definitely change up the zest and nut used in the 'frangipane' (though it technically won't be frangipane if another nut is used). I'm thinking lemon zest with apple preserves and a walnut topping or lime zest with blackberry jam and a hazelnut topping would be amazing! 3. Dot half the jam over the tart crust. Top with about half the frangipane. 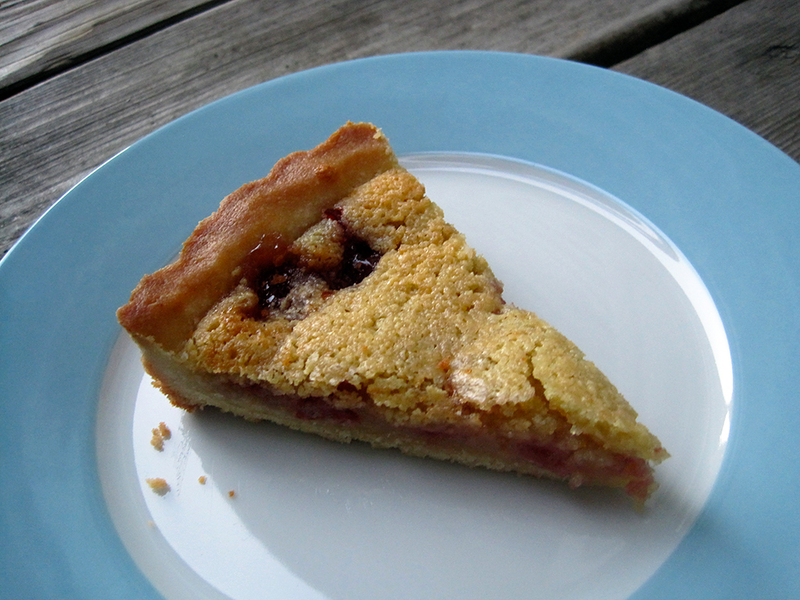 Spoon the rest of the jam over the frangipane, and top with the remaining frangipane. 4. Bake 25-30 minutes, until nicely browned. Serve warm (although leftovers keep well too). This soup is perfect for autumn and winter - it's hearty and healthy with creamy white beans, green kale, and a little bit of Italian sausage for richness - of course, feel free to use turkey or vegetarian sausage if you prefer. It's also a quick dinner or lunch, especially if you use canned beans - I had some cooked beans left over from another recipe, so I used those, but I wouldn't cook up beans specifically for this soup. The Parmesan rind sounds a little weird, but I had one on hand so I figured I would try it! It gets a little gross after cooking in the broth, so be sure to pull it out before serving - but I do think it added a little bit of je ne sais quoi to the dish, so give it a shot if you have some on hand! I made this soup on the less-brothy side just because that's what I was in the mood for, but you can easily add more chicken broth if you prefer. 1. Heat a soup pot over medium heat. Add the sausage and cook until browned. Using a slotted spoon, remove to a paper towel-lined plate. 2. Check the pot and add a little more oil if it seems dry (I found that the sausage created plenty, but your mileage may vary). When the oil is hot, add the onion, carrot, celery, and rosemary. Cook, stirring occasionally, until the vegetables start to get soft, 8-10 minutes. Add the tomato paste and garlic and cook, stirring, about a minute. 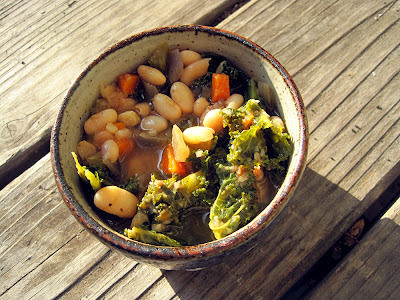 Pour in the broth along with the beans, kale, and Parmesan rind (if using). Bring to a boil and then reduce to a simmer. Simmer about 15 minutes, until the vegetables are tender. 3. Remove the Parmesan rind from the pot and add in the cooked sausage. Cook about 5 minutes to allow the flavors to combine, and then taste and adjust for salt and pepper. Wow, I made this dinner months ago, and somehow it got stuck in my draft posts! I'm not sure how, since it's definitely a favorite of mine and I've made it a couple of times...if you know me, you know that's unusual since I always say I will make things again but then get tempted by new recipes that I want to try! 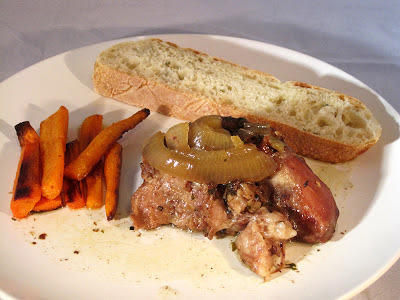 In any case, here it is today...go make this for dinner! The steak is prepared very simply, just seasoned and cooked to be as done as you like. I love flat iron steak because it's cheap but tender and flavorful. 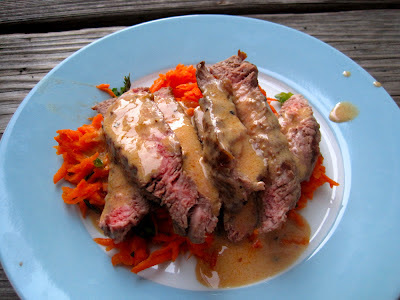 The steak sits on a bed of spicy shredded carrots - as those who follow this blog know, I am sort of obsessed with shredded carrot salads, and this one is no exception. The spice from the jalapeno combines with tart lime juice and salty fish sauce to create perfectly balanced flavors. Finally, a creamy red curry sauce is poured over everything to add richness and spice. So good, and also fairly quick and easy - love it! 1. Whisk together 1/2 T oil, 1 T lime juice, 1 T fish sauce, and 1/2 tsp brown sugar in a large bowl. Shave the carrots into the dressing with a vegetable peeler to make long, thin, wide strips (or grate the carrots). Add the cilantro and jalapeno pepper, and toss to coat. Set aside. 2. Season the steak on both sides with salt and pepper. Heat 1 T oil in a heavy skillet over medium high heat. Once the oil is hot, add the steak. Cook a few minutes on each side, until the steak is nicely browned on the outside and done to your liking on the inside (cooking time will depend on how thick your steak is). 3. Transfer the steak to a cutting board and cover loosely with foil. Return the skillet to the stove over medium-low heat. Add 1/4 cup of water (or so) and bring to a boil, scraping with a wooden spoon to remove browned bits from the bottom of the pan. Add the coconut milk, curry paste, remaining 1/2 T lime juice, remaining 1 tsp fish sauce, and remaining 1/2 tsp brown sugar. Cook, stirring constantly, until the sauce is thickened and fragrant, about 4-5 minutes. Season to taste with salt and pepper. 4. Thinly slice the steak across the grain. Mound some carrot salad on each plate, top with sliced steak, and then spoon the sauce over top. I didn't used to be a huge fan of lentils, but I've gotten really into cooking them this year - they're cheap, healthy, easy to prepare, and they work well with all sorts of flavors and cuisines. 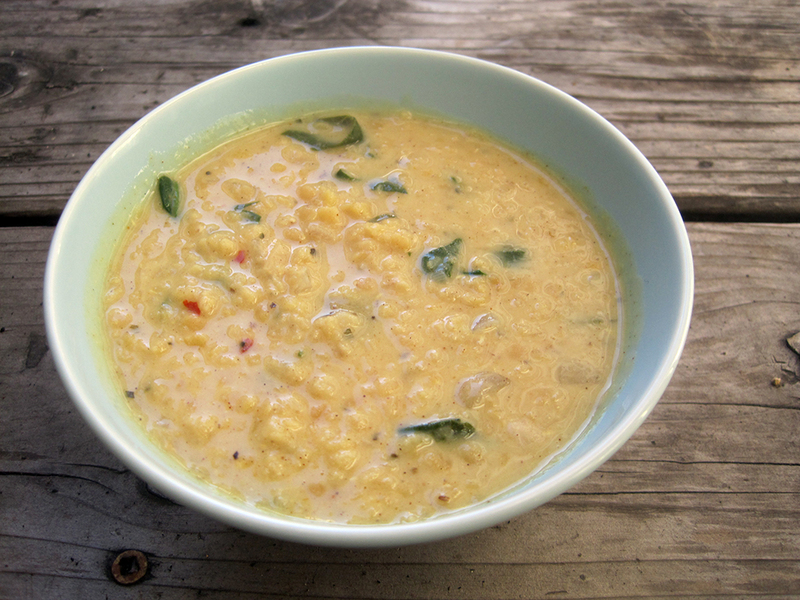 This Asian-inspired coconut curry soup is a great example of that - mild red lentils are a perfect base for flavorful spices, coconut milk, citrus, and lemongrass. I really enjoyed this soup, but I'd make a couple of changes if I make it in the future. First, I'd add more veggies - the spinach I added wilted down to almost nothing, so next time I'd either add more spinach or throw in some carrot or squash to bulk things up in the vegetable department. I'd also put in larger pieces of crushed lemongrass, let them cook with the soup, and then fish them out before serving - although the minced lemongrass approach does work with some dishes, in this case I found the texture to be distracting, though the flavor was good. Overall, this is a comforting, warm bowl of soup that will totally satisfy for lunch on a rainy day! 1. Combine the lentils, broth, thyme, and curry powder in a soup pot. Bring to a boil and then simmer about 15 minutes, until the lentils are cooked. 2. Meanwhile, heat the coconut oil in a pan over medium heat. Add the onion and saute until just browned Add the lemongrass, along with the salt, cardamom, cinnamon, red pepper flakes, and nutmeg. Cook for another minute or so, stirring often. Scrape the onion mixture into the cooked lentils. 3. Add the coconut milk and spinach to the soup and bring to a simmer. Simmer about 5 minutes, stirring occasionally. Stir in the lemon and lime juice, and then taste and adjust for seasoning. 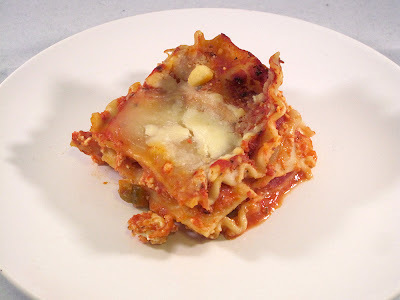 Following up on my lasagna love from last week is another delicious lasagna I made recently. This one is definitely quite a bit more involved - a weekend project for sure. But, all the work was totally worth it - this is one tasty lasagna! 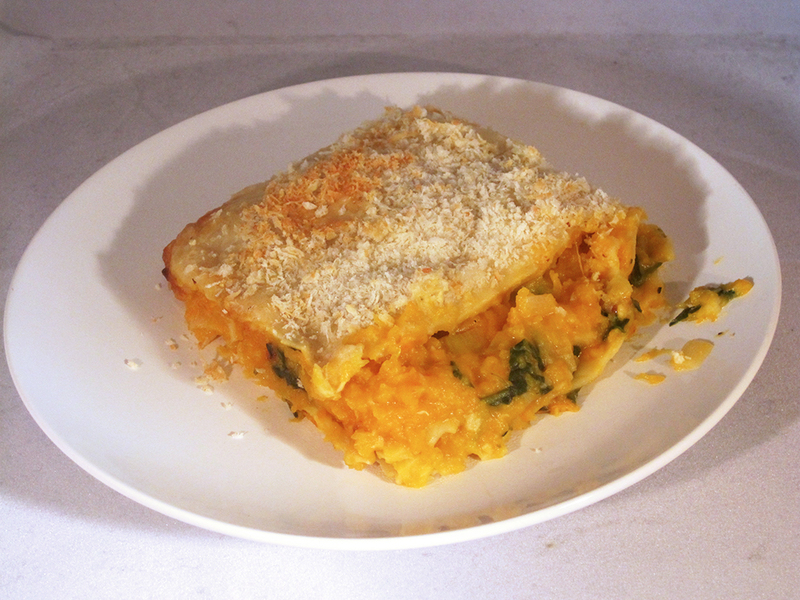 Thin homemade egg noodles are layered with a creamy goat cheese-squash-spinach layer, and then the whole thing is topped off with cheese and crunchy breadcrumbs. The only thing I'd change would be to add more goat cheese - perhaps crumbled in between some of the layers. While the filling was really delicious, the squash flavor definitely dominated and I didn't get quite the goat cheese-y 'tang' I was looking for. That's a small complaint, though, because overall Tim and I loved this dish! It's pretty rich, so it will serve a crowd. 1. Prepare the filling. Preheat the oven to 425 degrees. Place the squash halves cut-side-up on a large, foil-lined baking sheet. Drizzle with oil and rub onto all the cut surfaces. Place 2 garlic cloves and 1 sprig of thyme in the cavity of each squash. Season with salt and pepper. Roast 40-50 minutes, until the squash is tender. 2. Let cool until easy to handle. Discard the thyme leaves. Peel the garlic and place in a large bowl. Mash with a fork. Peel the skin off the squash (it should come off easily), and mash into the garlic. 3. In a large non-stick skillet, melt 1 T of the butter. Add the leeks and cook over medium-low heat until softened and just starting to brown. Rinse the chopped spinach and transfer to the skillet with a little water still clinging to the leaves. Stir until the spinach is wilted. Season with salt and pepper. Transfer to a paper-towel-lined colander and press out any excess moisture. Add to the bowl with the squash and stir to combine. 4. Prepare the sauce. In a large non-stick skillet, melt the remaining 4 T butter over medium-low heat. Add the sage and stir until fragrant, a few minutes. Remove the sage. 5. Whisk in the flour and cook until nicely browned. Whisk in the milk, pouring it in slowly to prevent lumps. Continue whisking until the mixture is thickened, about 10 minutes. Whisk in the goat cheese and 1/2 cup of the Parmesan and stir over the heat until melted. Season with salt and pepper, and then taste and adjust seasoning. 6. Finish the filling. Pour 1-1/2 cups of the sauce into a liquid measuring cup. Pour the rest of the cheese sauce into the squash filling, and stir to combine well. Taste and adjust for salt and pepper. 7. Assemble the lasagna. Preheat the oven to 350 degrees. Pour 1/2 cup of the sauce into a 9x13 baking pan. Add a layer of noodles, cutting them to fit into the pan. Add 1 cup of the squash mixture and spread in an even layer. Continue layering noodles and squash until you run out - it's ok if you end up with an extra-thick layer of squash or a double layer of noodles at the end! Just make sure to end with a noodle layer. 8. Pour the remaining 1 cup of sauce over the final layer of noodles and spread it out evenly. Sprinkle over the panko, followed by the remaining 1/2 cup of Parmesan. 9. Bake the lasagna. Spray a large piece of tin foil with oil and place it foil-side-down over the lasagna. Fold over the edges. Place the lasagna pan on a large rimmed baking sheet and then transfer to the oven. Bake 40 minutes. Remove the foil and bake another 15-20 minutes, until browned and bubbly. Cool 10 minutes before serving. Tim and I spent Thanksgiving this year with my aunt, uncle, and cousins in Seattle - it was a weekend of amazing food and lots of fun sight seeing and conversation. 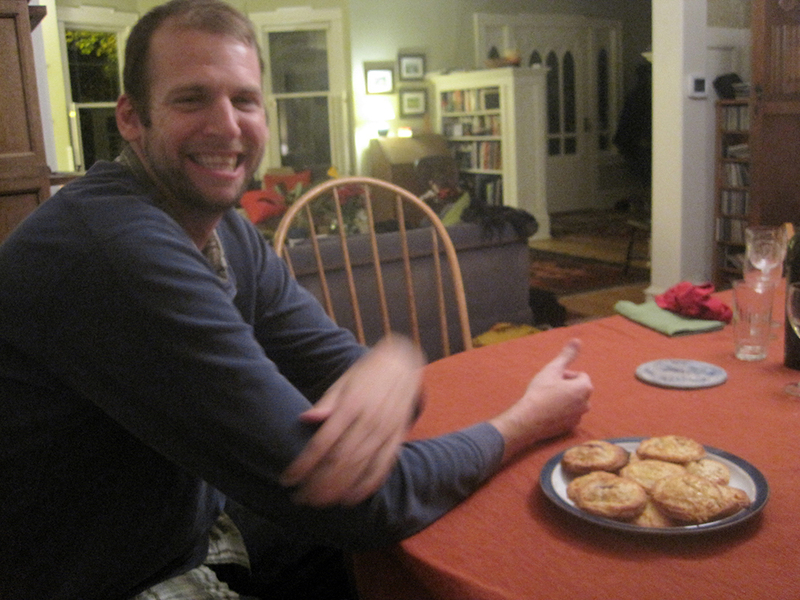 We got into Seattle around noon on Thanksgiving, so I didn't do a lot of cooking, but I did help out with a batch of cranberry hand pies. These were so tasty - we thought they tasted like super fancy Pop Tarts! The crust is extra tender and a little sweet, and the filling is tart and scented with orange zest and vanilla bean. The only warning I'll give about this recipe - and it's certainly not a bad one - is that the yield on the recipe is way off. I would say this could make almost twice as many pies as the recipe claims (16). We ended up making 16 for Thanksgiving, and then rolling out the extra dough and filling a smallish pie plate with dough and filling the next day - both versions were totally delicious...the little pies are more fun, but also more work, so you mileage may vary as to which way you want to put this together! 1. Make the dough. Whisk together the flour, sugar, and salt. Cut in the butter and shortening. Drizzle in about 1/4 cup cold water and mix in with a fork. Continue to add water a little at a time and stir with a fork until a dough forms. It's definitely ok if there are some larger pieces of butter or shortening visible in the dough. Divide in half, form into disks, and wrap in plastic. Chill for two hours. 2. Make the filling. Combine everything in a medium saucepan - include both the vanilla beans and the scraped seeds. Let stand for 10 minutes. Then cook over medium heat until the mixture comes to a simmer and begins to thicken, about 10-12 minutes. Let cool completely. 3. Assemble. Line baking sheets with parchment paper. Roll out the dough as thinly as possible, using lots of flour as needed (this is a soft dough). Aim for an eighth of an inch to a sixteenth of an inch thick, working with one disk at a time. Cut out circles using a 3-inch cookie cutter or a glass with a similar diameter. 4. Place half the circles on the parchment-lined baking sheets. Brush the edges of the circles with beaten egg. Place a heaping tablespoon of the filling in the center of each circle. Then top with the remaining circles. Crimp the edges with a fork. Brush the tops with egg, and sprinkle with raw sugar. Cut a small X in the top of each pie. Let chill for 30-45 minutes. 5. Preheat oven to 425 degrees. Bake pies until the crust is golden brown, 17-20 minutes. Let cool on baking sheets for 5 minutes and then cool on a wire rack. Thanksgiving Dinner! We had turkey, gravy, mashed potatoes with celery root, stuffing, cranberry sauce, ginger-cranberry compote, roasted green beans, kale-kohlrabi salad, Waldorf salad, brown butter Brussels sprouts, pickled plums, and fresh sourdough rolls. Such a feast! Tim is ready for dessert! Along with the pies we had my cousin's salted caramel ice cream...so tasty! I'm sending this recipe to My Kitchen Addiction's Holiday Recipe Challenge! You get great pepper flavor in this dish from both the sauce (I used a jarred red pepper sauce) and lots of chopped roasted peppers. Of course you can make this lasagna more 'homemade' but making your own sauce and your own roasted peppers, but it was really delicious even using the jarred varieties of both. The roasted red peppers are complemented by four types of cheese: creamy ricotta, tangy goat cheese, gooey fresh mozzarella, and a sprinkle of Parmesan. I also added Italian turkey sausage to the lasagna simply because my book club is more of a meat-eating bunch, but I didn't think it was essential - this would also be really delicious as a vegetarian main. Serve it alongside garlic bread for a fantastic Italian feast! 1. Preheat oven to 350 degrees. Using a 9x13 lasagna pan, spread a thin layer of sauce in the bottom of the pan. Fit four noodles into the bottom of the pan (three will go lengthwise, and the fourth will go crosswise with a bit broken off the end). Spread each noodle with a thick layer of ricotta (use about half the ricotta). Scatter over half the turkey and half the Italian sausage, and then sprinkle on a good amount of Parmesan cheese. Drizzle over a thick layer of sauce, and then spread everything together with the back of a spoon. 2. Cover with another layer of noodles. Spread the remaining ricotta over the noodles. Sprinkle over the remaining sausage, red peppers, and all of the goat cheese. Drizzle with another layer of sauce and then even out the layer with the back of a spoon. 3. Cover with a final layer of noodles. Pour the remaining sauce over the noodles, spreading with spoon to make sure all exposed noodles are covered. Distribute the fresh mozzarella as evenly as possible, and then sprinkle with Parmesan. 4. Spray a big piece of foil with oil, and then cover the lasagna. Bake in a 350 degree oven for 40 minutes. Remove the foil and cook for another 10 minutes to let the cheese get browned. 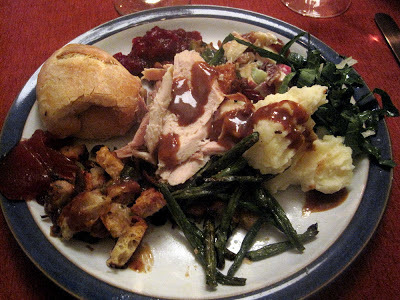 Remove from oven, recover with foil, and let rest 10-20 minutes before serving. I made this somewhat strange dish because we had tons of beets from our CSA box to use up. It's definitely for people who are feeling a little adventurous, as the beet tzatsiki is seriously hot pink. Color aside, the tzatziki is really delicious - creamy, tart, and the perfect complement for fritters of any sort. These chickpea fritters were also both tasty and a bit cosmetically challenged. The fritters were pretty crumbly and difficult to flip, but the flavor was good - sort of hummus-flavored with a little kick from the Aleppo pepper. I probably would not make them again though - I've had tastier fritters and these were just a bit too fussy. 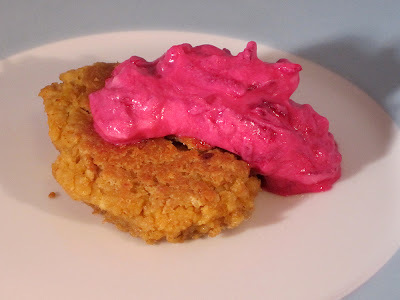 I'd definitely make the beet tzatziki again - but maybe with golden beets next time! 1. Drain and rinse the chickpeas. Place them in the food processor along with 2 cloves of garlic, the cumin, coriander, paprika, egg, and a generous pinch each of salt and pepper. Process until mostly smooth with some texture remaining. Let sit while you prep the tzatziki. 2. Mince the remaining garlic clove and combine in a bowl with the beet and yogurt. Season generously with salt and pepper. 3. Heat a nonstick skillet over medium heat. Add enough oil to coat the bottom of the skillet. Scoop spoonfuls of the chickpea mixture into the skillet and press down on the top a bit to flatter. Let cook without disturbing until the bottoms are golden brown, and then very carefully flip and cook the other side until browned. Finish cooking in batches until all the fritters are cooked. Serve with the beet tzatsiki. I made this recipe because we got sweet potatoes, carrots, and onions in our CSA box, and I was so happy I did. One problem with some lentil soup recipes, at least in my book, is that their veggie content is fairly minimal - so while they're certainly still one of your healthier lunch options, there's still a little something lacking. This recipe solves that problem by combining a small amount of red lentils with lots of carrots and sweet potatoes to create a comforting bowl of orange soup. It's great because you get lots of flavor and vitamins from the vegetables, but the soup is also more hearty than a veggie-only soup because of the lentils. Definitely don't skip the squeeze of lemon at the end - the acidity really brightens up the flavor. Serve this alongside a piece of bread for a super tasty lunch. 1. Set a soup pot over medium low heat. Add enough oil to coat the bottom of the pan. Once the oil is hot, add the onion, garlic, and ginger. Cook, stirring occasionally, until the onion is very soft, about 10 minutes. 2. Add the lentils, sweet potatoes, carrots, garam masala, and chicken stock. Bring to a boil and then reduce to a simmer. Simmer about 30 minutes, until the veggies are tender. 3. 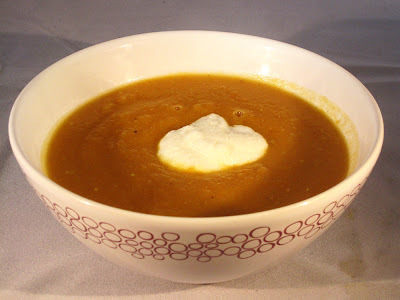 Use an immersion blender to puree the soup until very smooth. Continue to simmer until the soup is as thick as you like it (I went another 20 minutes or so). Stir in the lemon juice, and then taste and adjust for salt - you may not need to add any if your chicken stock was salty. 4. Serve with a bit of yogurt stirred into each bowl. Potato gratin is one of my favorite celebratory side dishes, but sometimes it's fun to switch it up (whether it's a holiday or not). 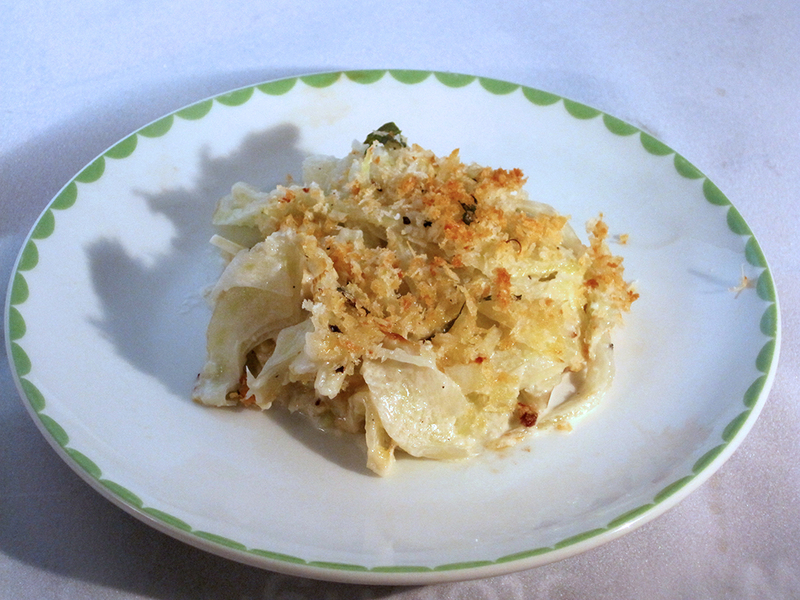 This gratin replaces the potatoes with thinly sliced fennel, which is a veggie I love and use all the time. It's great raw in salads, and it's a great substitute for celery in pretty much everything if you're not a celery fan (like me). This gratin is yet another use for this versatile vegetable. Despite all the cream, the dish feels much lighter than a potato gratin, with tender slices of fennel in cream sauce covered with a blanket of Parmesan bread crumbs. Serve this next to simple roasted meat or as part of a holiday side dish spread, and it's sure to add something special to your meal. 1. Preheat the oven to 400 degrees. Spray a 2-quart casserole dish with oil. 2. In a large skillet or pot, combine the fennel, cream, and water. Season with salt and pepper. Bring to a simmer over medium heat, stirring occasionally. Transfer to the casserole dish. 4. Place the dish on a foil-lined baking sheet. Bake until the topping is golden and crisp, 30 minutes. If you liked the crispy smashed potatoes I posted on Monday, you won't want to miss the main dish I served with them: Swedish meatballs! I have to admit, I've actually never had the famous Swedish meatballs from Ikea, mostly because I am always too tempted by their mac and cheese! So, I can't say for sure how these compare - but I can definitely say they are really delicious. These meatballs get a shortcut by starting with Italian sausage, so they're pre-spiced. Just add breadcrumbs, milk, and a little bonus nutmeg to get great meatball flavor. Most of the effort in this recipe is rolling the meatballs, so grab a partner if you've got someone that can help. After the meatballs are rolled, they're simply browned and combined with a simple pan gravy. My sauce never really thickened like it was supposed to, but it was still totally creamy and delicious - next time, I might splurge on some creme fraiche for a fancier sauce, but sour cream totally got the job done. 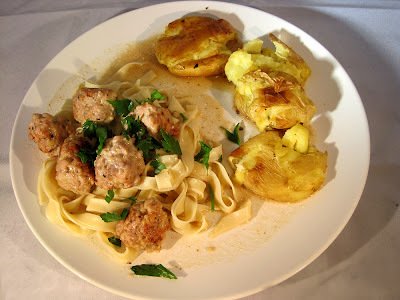 I served these tasty meatballs over fresh pasta. I've been participating in a political forecasting project for the past year or so, and I used my 'honorarium' from the first year to snag a pricey item I've been wanting for a long time - the pasta attachment for my Kitchen Aid! I've had a manual pasta machine in the past, but it was ultimately just too much work and I didn't like using it. The Kitchen Aid version is awesome - it definitely made making fresh pasta a lot more fun. Still a weekend activity, but one I can look forward to rather than dreading! And the pasta turned out perfectly - score! I'll definitely be making this again soon. 1. Make the pasta. Combine all the ingredients in the bowl of a stand mixer. Mix with the paddle for about 30 seconds, and then switch to the dough hook and mix on low speed for a few minutes, adding more water as needed, until the dough pulls together in clumps. Knead by hand for a minute or so to create a cohesive ball of dough. Cover with a towel and let rest for 20 minutes. 2. After the dough has rested, divide into four pieces and roll out in a pasta machine following the instructions for your pasta machine. Cut into desired shape (I made fettuccine). Let dry over the backs of towel-covered chairs while you prepare the rest of the recipe. 3. Make the meatballs. In a large bowl, gently mix together the sausage, panko, milk, and half the nutmeg. Season with salt and pepper. Roll into smallish meatballs. 4. Heat olive oil in two wide non-stick skillets - use enough to just cover the bottoms of the skillets. Brown the meatballs on all sides, and then add 1 cup beef broth to each skillet. Cover and simmer about 10 minutes. Uncover and continue to simmer until the broth just coats the back of a spoon. Meanwhile, put a big pot of salted water to boil for the pasta. 5. Combine the meatballs and sauce into one skillet (assuming it fits - if not, you can keep them separated). Add the remaining nutmeg and the sour cream. Stir briskly to combine the sauce - mine stayed a little separated, but was still tasty. 6. Cook the pasta in the boiling water for about 2 minutes, and then drain. 7. Serve the meatballs and sauce over the fresh pasta. Sprinkle with parsley. For this month's Secret Recipe Club, I was paired up with Veggie Grettie. Gretchen's blog is full of awesome-looking recipes, and they're all vegan and gluten free! I chose to make her recipe for crispy smashed potatoes. I've seen this sort of recipe on a few different blogs and it always looked really delicious, so this was the perfect excuse to give it a spin! I'm definitely a big fan - the potatoes come out of the oven with a perfectly crispy, salty exterior and a creamy interior. They make a great side dish, and you can easily change up the flavor by using different sorts of seasoning salt. I served these with Swedish meatballs and homemade egg noodles - recipe coming soon! 1. Preheat the oven to 425 degrees. Line a large baking sheet with foil. 3. Bake 20-30 minutes, shaking the baking sheet occasionally, until the potatoes are tender. 4. Use a heavy water glass or something similar to smash each potato until it is slightly flattened. Space out the potatoes evenly, and then drizzle with a bit more oil. 5. Bake another 15 minutes or so, until crispy. A few weeks ago, I managed to find fresh figs at Trader Joe's for only $2 a pound! I quickly snapped up four pounds, and used half of the figs to make this fantastic jam. Since it doesn't use pectin, it's not overly sweet, and the balsamic vinegar adds a lovely acidic element. 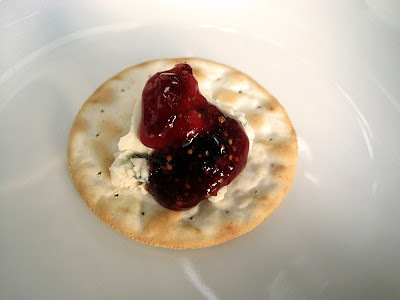 This jam is fantastic with cheese and crackers - here, I served it with a creamy blue cheese, and the two were a perfect pairing. But, it's not just good in savory bites - I've also enjoyed it on toast and in a plain old PB&J. This is one jam I may be keeping all for myself rather than giving it away...it's that good! 1. Combine the figs, sugar, and vinegar in a large pot (use the biggest you've got for jam-making so you don't risk boiling over). Bring to a simmer, and then reduce heat to medium low, maintaining a gentle simmer and stirring often. Continue to simmer and stir until the jam thickens and passes the gel test, about 30 minutes. 2. Use an immersion blender to blend the jam until it's as smooth as you like it - I made mine fairly smooth. Stir in the lemon juice and briefly return to a boil. 3. Transfer the jam to sterilized jars and process in a boiling water bath for 15 minutes. Make sure to check seals before storing. This tasty salad is a great way to eat your veggies. I love using kale in salads, but it needs a little bit of special treatment in order to be tasty raw. I combine finely chopped kale with salt, lemon juice, and oil, and mash it between my fingers for a couple of minutes until it begins to wilt. Then I let it chill out for a bit while I prep the rest of the meal, and then add some finishing touches - in this case, shredded carrots and toasted pine nuts. A cumin-honey dressing adds some smoky sweetness. This makes a great side dish for pretty much any meal - you could play around with the spices to pair it with different cuisines. And, it keeps well in the fridge for a few days, so it's a great make-ahead side or a delicious green option to take for lunch. 1. Place the chopped kale in a salad bowl. Slice the lemon in half, and squeeze the juice of half the lemon over the kale (reserve the rest of the lemon for later in the recipe). Drizzle on a bit of olive oil and sprinkle a pinch of salt over the greens. Massage the greens with your hands for a couple of minutes, until they are nicely wilted. Stash in the fridge while you prepare the rest of the salad/meal. 2. In a small jar, combine the juice of the other half of the lemon along with about 1/4 cup olive oil, a pinch of salt, the honey, and the cumin. Screw on the lid tightly and shake well to combine. 3. 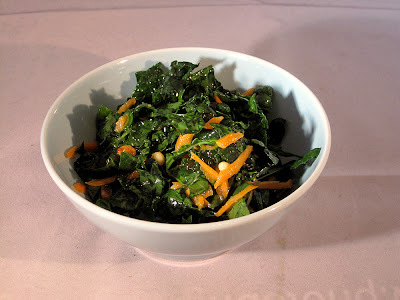 Take out the bowl of kale and add the dressing, carrots, and pine nuts. Toss to combine. I wasn't in the mood for a big birthday party this year because I have so much going on with school this semester, so instead I decided to celebrate with a small dinner party at home. Since I was feeling a little overextended, I decided to make something that would impress my guests without involving a ton of work on my part. Enter the slow cooker! I love being able to do a little bit of prep early in the day and then have dinner ready when I need it. This pot roast with herbs and sweet onions is melt-in-your-mouth tender and has great flavor, all for maybe 15-20 minutes of work. I served it with roasted carrots (cooked separately in the oven a few minutes before the roast was done) and good bread from the grocery. The leftovers were really tasty too, especially with some blue cheese crumbled on top. 1. Season the meat generously with salt and pepper on both sides. 2. In a large skillet, heat just enough oil to coat the bottom over medium high heat. Add the meat (working in batches if necessary), and cook for a few minutes on each side, until nicely browned. Be very careful when flipping, as the oil will spatter. 4. Cut the onion into medium-thick slices, and then scatter all over the meat. I really love muffins for breakfast, but sometimes it's fun to switch it up a bit and go with savory muffins instead of sweet ones. These take a little longer than your typical muffin recipe because of the caramelized onions - this step definitely takes some time (probably 25-30 minutes), but it's so worth it for the sweet, soft onions that result. I recommend making a double batch and using the extra onions in another dish (maybe in an omelette). Once the onions are done, they're combined with shredded cheddar and corn muffin batter to make some seriously dynamite muffins. Next time I might also add some minced chives for a pop of green, but overall I was really happy with these morning treats. They'd also be excellent next to a bowl of chili later in the day. 1. Preheat the oven to 375 and line muffin tins with baking papers. 2. Caramelize your onions, low and slow in a nonstick pan. When they're done, let cool and roughly chop. Set aside. 3. Whisk together the flour, corn flour, baking powder, salt, and baking soda. 4. In a large bowl, whisk together the eggs, buttermilk, melted butter, and honey. Whisk in the dry ingredients. Fold in the caramelized onions and cheese. 5. Fill the muffin cups, using about 1/4 cup of batter per muffin. Bake 20-25 minutes, until the tops are browned and a tester comes out clean. I make cookies for an event at my church most months, and it's always a good excuse to try a new recipe. In October, I wanted to make something appropriate for the season, so I settled on these chocolate chip cookies with an autumn twist. Cloves, nutmeg, and cardamom spice up these cookies and make them the perfect choice for when the air starts to get a bit chilly. The original recipe called for molasses, which I would definitely use if I made these again - I thought I had it in the cupboard, but only discovered it was missing after I'd started the recipe. I subbed in dark corn syrup, which worked just fine (and made the cookies extra chewy), but didn't have the same intense flavor that molasses would have contributed. Either way, these spice cookies were definitely the perfect choice for October! 1. Preheat the oven to 350 degrees and line two baking sheets with parchment, foil, or a Sil-pat. 2. Whisk together the flour, baking soda, spices, and salt in a small bowl. 3. Using an electric mixer, beat the butter until fluffy, 2-3 minutes. Add both sugars and beat another 2 minutes or so. Beat in the egg until fully incorporated, followed by the corn syrup. Beat in the flour-spice mixture until just incorporated, and then stir in the chocolate using a rubber spatula. 4. Scoop the batter onto cookie sheets in small spoonfuls. Bake 6-8 minutes, until set on top - be careful, these burned easily. This is one of those high-effort but high-reward dishes. It's definitely got a heck of a lot of steps - cooking the chard and then squeezing it dry, making a sauce, slicing sweet potatoes, grating cheese, and then putting everything together and baking. So it's for sure more of a weekend project rather than a weekday dinner. That said, if you have the time, this dish is totally worth it. The creamy potatoes combine really well with the more earthy greens, and the sauce binds everything together nicely. I'd actually add more cheese and sauce if I made this again - I was adjusting the recipe for the amount of sweet potatoes and chard that we got in our CSA, and I think I got the ratio a little off. The gratin was plenty creamy and delicious, but hey - you can never go wrong with more cheese and bechamel! 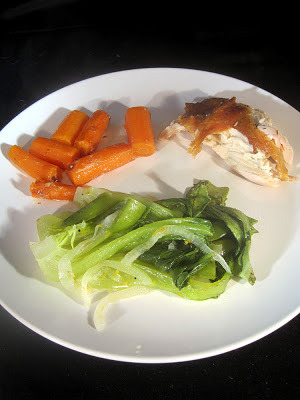 Serve this with a simple protein - maybe roasted chicken or seared steak - and you've got a fantastic dinner. 1. Prepare the greens. Melt 1 T of the butter in a heavy pot over medium-low heat, stirring often, until softened and starting to brown. While the onions cook, separate the chard leaves from the stems. Chop the stems into fairly small pieces, and cut or tear the leaves into roughly 1-inch pieces (nothing here has to be exact). Once the onions are soft, add the chard stems along with the nutmeg and a sprinkle of salt and pepper. Cook, stirring, until the veggies are tender, about 8 minutes. Increase heat to medium-high and add the chard leaves in batches if necessary, stirring until all the greens are wilted. 2. Line a colander with cheesecloth and pour the greens into the cheesecloth. Let rest until cool enough to handle, and then squeeze the greens to remove as much liquid as possible - it will be a lot! Set aside. 3. Make the sauce. Combine the half-and-half and garlic in a small saucepan and bring to a simmer. Meanwhile, melt the remaining 1 T butter in a nonstick skillet over moderate heat. Add the flour and whisk to combine using a silicone whisk (which will be safe for the nonstick coating). Cook the roux, whisking, for about 1 minute. Slowly whisk in the warm half-and-half and boil, whisking, for one minute. Season with salt and pepper and then set aside. 4. Assemble the gratin. Preheat the oven to 400 degrees and spray a 1-1/4 quart (or so) baking dish with oil. Spread half the sweet potatoes into the dish in an even layer. Sprinkle with a little salt and pepper, a quarter of the herbs, and about 2 T of the shredded cheese. Distribute half the greens evenly over the cheese, and the season with a bit of salt and pepper, a quarter of the herbs, and 2 T cheese. Check the bechamel - if it's quite thick, whisk in a little more half-and-half to get a pourable consistency. Then pour half the bechamel sauce over the greens. Spread it around a bit with a rubber spatula. Then repeat the same layering as the first time around, ending with any remaining cheese. 5. Bake about 1 hour, until golden and bubbling. Let stand 10 minutes before serving. 6. If you want to prepare this ahead - you can prep and assemble everything the day before and stash in the fridge. Then you'll just have the baking to do the night you want to eat the gratin. 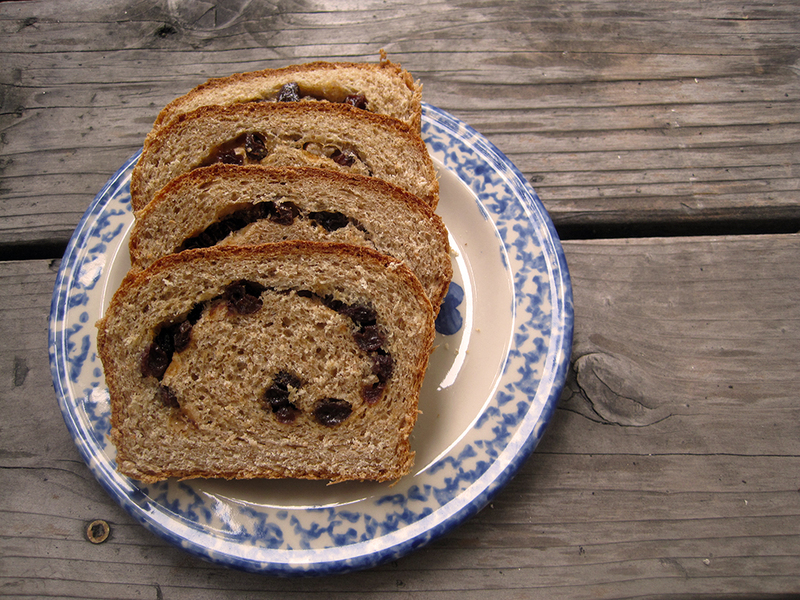 I've had a craving for cinnamon-raisin bread recently, and just got around to making some. I started with a tried-and-true whole wheat loaf to make the bread a little healthier. After the first rise, I gently patted it into a rectangle - this dough is not to soft, so it's really easy to work with. Then I topped the dough with raisins and a bunch of grinds from the Trader Joe's cinnamon-and-sugar grinder that I recently got (this thing is genius!). Of course, you can just mix up some cinnamon and sugar yourself if you're not near a Trader Joe's. The bread baked up soft and delicious, with great flavor. And, it's not too sweet - you can enjoy this for breakfast with butter, but it also works as the base for a PB & J at lunchtime. 1. Prepare the dough for the bread up through the first rise. While the bread is rising, pour boiling water over the raisins until they are covered by a few inches. Let sit for half an hour or so, and then drain well. 2. Punch down the dough and press into a rectangle as long as your loaf pan. You shouldn't need flour as the dough is not very sticky. Sprinkle the raisins over the dough, leaving about a 1/2-inch border all the way around. Sprinkle generously with the cinnamon and sugar - I just did several grinds of the cinnamon-sugar grinder until the raisins looked well-covered. 3. Roll up the dough into a log and press into an oiled loaf pan. Proceed with the rest of the bread recipe, baking about 5 minutes longer. Let cool before slicing. I'm sending this recipe off to Kitchen Bootcamp: Yeast Breads! I find fish for dinner to be sort of a funny middle ground in terms of effort - you've really got to hit the grocery that day if you want it to be fresh, but then actual preparation time is often minimal. The grocery bit is probably why I don't end up making fish as often as I'd like to, but this recipe is absolutely good incentive. The fish itself is prepared super simply - just cooked on the stovetop with salt and pepper. You could use any flaky white fish here - snapper, cod, etc. and cook it up any way you prefer - it would also be tasty baked in the oven if you happen to be making a roasted veggie side dish. The star of this dish is the citrus salsa - I used orange, lemon, and grapefruit, but the original Mark Bittman article says that any combo you have on hand will be tasty. It's spiced up with some seriously spicy habanero - be careful here, and use more or less depending on your spice tolerance. 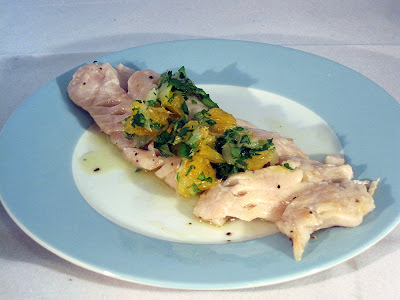 The tart citrus and herby cilantro goes perfectly with the fish - a super easy and tasty dinner. Definitely serve this with a big scoop of white rice. 1. Supreme the orange, grapefruit, and lemon, catching the juice in a bowl. Add the sections of fruit to the bowl with the fruit. Add the cilantro, chili, and generous pinch of salt. Use more or less habanero depending on your tolerance for spicy food. Mix to combine and let sit while you prepare the fish. 2. Place a large skillet over medium-high heat (you may need two skillets or you may need to work in batches). Season the fish with salt and pepper. Add enough oil to coat the bottom of the skillet. Once the oil is shimmering, add the cod. Cook it 3-4 minutes per side, flipping once, or until the fish flakes easily and is opaque in the center. 3. Serve the fish with the citrus salsa. Today is my birthday! And although this isn't a birthday cake - it's one a made a week or so ago - I still thought it would be appropriate to celebrate with a cake post! 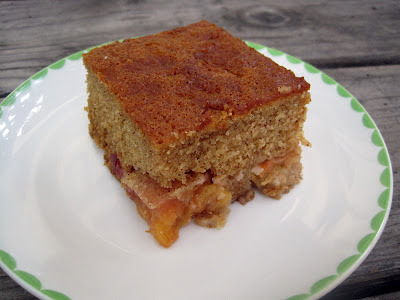 This cake is absolutely fantastic - moist and spicy with a sweet-tart layer of juicy plums on the bottom. We got some sort of weird plums in our CSA - they never really got soft enough to eat raw, but the skin was clearly starting to get a little wrinkly and old-looking. This recipe is the perfect use for imperfect fruit - after baking, the plums were so delicious and it was impossible to tell that they weren't in their prime. If you have access to golden syrup, you can use it in place of the dark corn syrup, as that's what the recipe originally called for. I know everywhere online says golden syrup is supposedly impossible to substitute for, but don't let a lack of access stop you from making this cake! It works perfectly well with dark corn syrup, which should be easily available in American grocery stores. Whatever you can get, definitely make this cake sometime before plums go out of season. It's like autumn in cake form, and it lasts really well if you have leftovers. 1. Preheat the oven to 350 degrees and line a 9x13 baking pan with parchment. Spray the parchment with oil. 2. Sift together the flour, baking powder, cinnamon, and baking soda in a large mixing bowl. 3. Combine the dark corn syrup, honey, and butter in a small saucepan. Heat over medium-low heat until the butter is melted. Add the brown sugar and stir to combine over the heat for a minute or two. 4. Using a two cup liquid measuring cup, measure out the milk. Add the eggs, and then whisk to combine. 5. Pour the golden syrup mixture into the flour and mix together until almost blended. Add the egg-milk mixture and whisk until well combined. 6. Lay the plums in the cake pan, each with one cut side down. Pour the batter over the plums. Bake about 35 minutes, until a tester comes out clean.